The Faith Works Uniting Community of Norman Park, previously known as the Norman Park Methodist church, is celebrating its one hundredth birthday. It was in July of 1917 when the church, then just one building catering to the roughly one thousand people settled in Norman Park, was erected under Reverend Frederick Hof. Since then, the church has evolved to cater to the broader needs of the Norman Park community, which has grown in the past one hundred years to over six thousand residents, while maintaining its rich history and tradition. The history of the Norman Park church dates back to when Norman Park was a small community located on the outskirts of Brisbane which was then known as National Park. While Norman Park was settled in 1853, its progression and growth was thwarted by a number of factors such as a lack of adequate transportation and great flooding in the area which threatened residents and hindered settlement. It wasn't until the tram line was introduced in 1903 that settlement of Norman Park began to take off. Followed by the arrival of the Norman Park train station in 1911 and the post office in 1914, which allowed for incremental growth to occur. 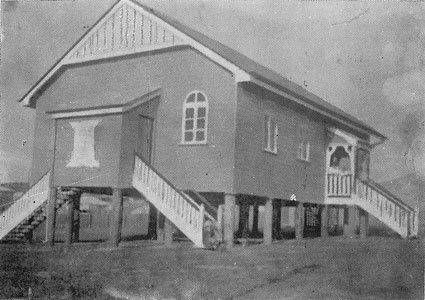 It was not long after, in February of 1917 that the Trustees of the East Brisbane church agreed that there was an overwhelming need for a church in this up-and-coming suburb, made up of young married couples and their children. With that, the land on the corner of Bennetts Road and Mcllwraith Avenue was purchased for a mere £95. When it was opened, and dedicated on July 22nd 1917, there were forty-nine members with fifty Sunday school attendees. Since that time, the church has grown in numbers and had numerous ministers presiding over the Norman Park congregation, offering refuge to residents impacted by world wars, great depressions and natural disasters. The church has remained a symbol of not only faith but of hope and charity during some of Norman Park's most difficult years and some of its most exciting times. Fast forward to the present day and the Faith Works Uniting Community stands with the original Norman Park chapel, not having lost its devotion to the community and its charitable spirit. Under the care of Reverend Linda Hanson, Faith Works UC at Norman Park is now not only a place of worship but a community centre where members and non-members can use the newly renovated spaces for education and community activities. With that, the church would like to celebrate its birthday and this milestone by inviting members of the community to join them in remembering the past century at a very special High Tea on Saturday, 29 July from 15:00-17:00 at Faith Works Uniting Community Norman Park. Ticket sales will be commencing 20th June 2017 and will include refreshments, a photographic exhibition and chance to immerse yourself in one hundred years of history. So, mark your calendars and get ready to journey through time.